Discussion in 'COMMERCIAL Announcements' started by Spip, Dec 18, 2015. 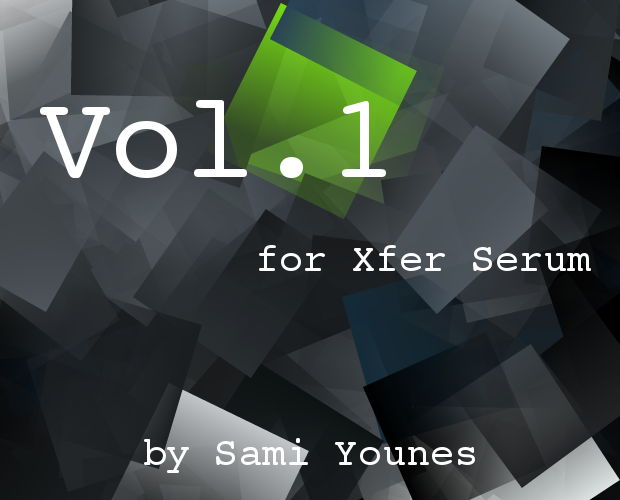 Let me present to you my Soundset Vol.1 for Xfer Serum. Evolving, powerful and complex sounds that never really sound identical twice and always sound deliciously different one note after the other. Just for one thing : to be a pleasure to play. Thanks to all of you who have already bought it ! Sale extended until the end of the month ! Thank you to all the early adopters ! Really enjoying this patch bank Sami. Thanks for making very good sounds for Serum that are not all EDM, Serum can go so beyond that cliche when in the hands of a capable programmer. These patches fit in the mix well and also sound big. Some can tax cpu a bit (even on my vader helmet 6 core). Overall a job well done and look forward to Vol .2. About the CPU hit. Serum is well known for being a CPU hog. In my experience, it becomes only a problem when sounds have really long release time, or when a lot of voices are playing at the same time. Mallets are a good example. I was thinking of making a sampled version of this soundset for Kontakt. Particularly the mallets sounds, for this very reason. Obviously, you loose the flexibility of the synth engine but gain the power of Kontakt. I love any sound designer that's willing to do something with a soft synth other than EDM. So many of the synths out there are awesome for more cinematic-style work, but have exactly 0 commercial sound banks available that are anything but EDM (I love Cyclop for creating moving atmospheres!). I don't write any EDM, and Serum is currently getting the most use of all my soft synths, so I thank you very much for this Sami! I'm really happy to read this as it is exactly what I was trying to achieve. Just a follow-up on this - I can say that this bank is definitively my new favorite Serum bank. The many varied mallet patches are awesome! I didn't start to really appreciate it until I started moving CCs around a little, and found that the amount of sonic variety in (literally) every patch is astounding. Very, very well done Sami, thank you! I've used this in at least 3 projects I can think of so far. Thank you so much for the follow-up ! Nice to hear that this soundset stands the test of time and it is still used today ! What do you mean by moving CCs ? Automating the macros or anything else ? Don't hesitate to send me a link to your projects when finished. I would be happy to listen to these sounds in real life. Moving CC's meant moving around the mod wheel, really opens up the possibilities, since you tied so much to that And re: the links, will do! SPRING SALE ! 25% OFF until 4 April.